Join us to discuss Mexico’s general election and the violent context in which it is taking place. What is the agenda on human rights? Helen Goodman MP – Helen will discuss the importance of international electoral observers. Christine Blower (National Education Union) – Christine will talk about the long struggle of teachers in Mexico and where the Education Reform stands with this coming election. 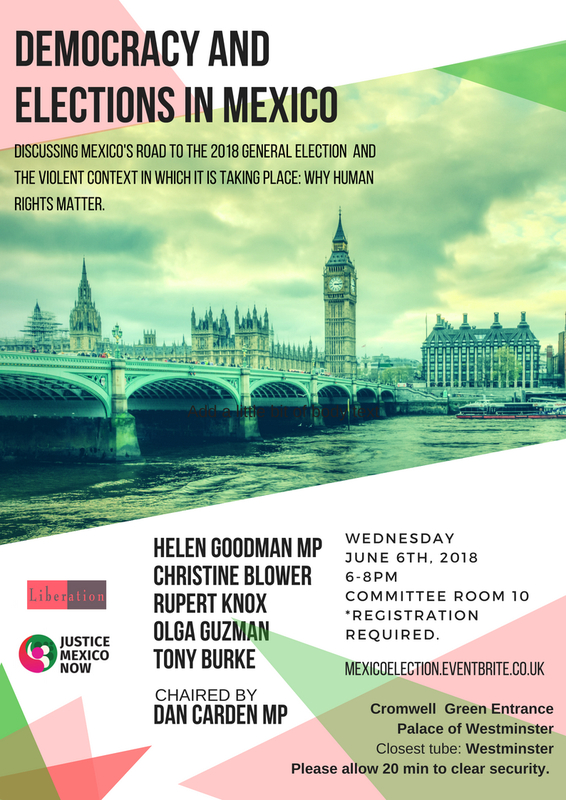 Rupert Knox (JMN) – Rupert will talk about his future visit to Mexico as an International Electoral Observer. He will discuss the agendas on human rights and the threats that the current violent environment poses to democracy. Tony Burke (UNITE) – Tony will talk about his recent visit to Mexico and his meetings with worker’s unions. What would the election mean for worker’s rights, especially industry workers? Cromwell Green entrance in the main Palace of Westminster. Please allow at least 20 min to clear security. No sharp objects allowed.